Posted January 16, 2015 by Admin & filed under News. Coffee is a big part of our history here at Josef’s Vienna. When Josef opened his doors in 1980, he envisioned a small European-style shop where he could enjoy one of his confections with a rich, bold cup of coffee. He knew the value of good quality coffee and how it could grow his business. Years later, we were approached by a man named Carl Staub. He was a coffee scientist, and he had the most amazing coffee we had ever tasted. He was roasting beans locally, with his company, Agtron. We have been faithful consumers ever since. To find out more about what Agtron does, read this wonderful article. This weekend is National Gourmet Coffee day, and here at Josef’s, we have coffee. Lots and lots of coffee. Alongside your French Apple Danish, you might want a Caffe Latte. Or maybe it’s early in the morning, and you need a Cappuccino. Josef’s is the place for you. 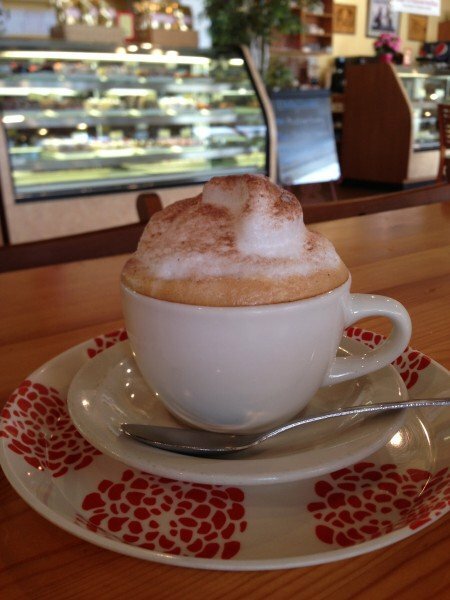 We have a full selection of coffees and espressos to accompany any of our sweet or savory treats. We also have Creamy Tiramisu in our bakery for you to take home and enjoy for dessert. Don’t miss our 1 pound Agtron coffee bags too, available in leaded or unleaded.